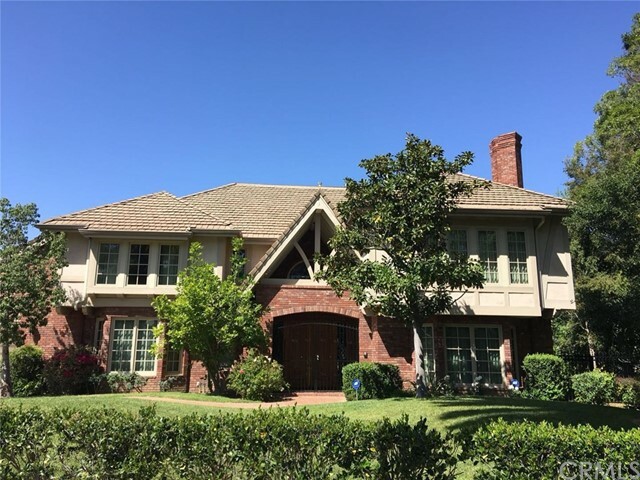 All Pasadena homes currently listed for sale in Pasadena as of 04/20/2019 are shown below. You can change the search criteria at any time by pressing the 'Change Search' button below. "Designed by the prestigious firm of Marston & Van Pelt with Palladianism in mind, Arden Villa is one of those grand estates that is all at once infamous & private. Cloistered behind massive gates, which open to 100 yard tree-lined driveway & away from prying eyes the main residence offers grand entertainment rooms, lavish Master suite, 11 lavatories, game rooms, wine cellar, office spaces & possibilities for more sleeping quarters/entertainment spaces. The extensive grounds include vast manicured gardens, lily ponds, tennis court, swimming pools & tranquil spaces. The recent addition of a secondary residence located at 1193 Arden, has created the opportunity for a truly private compound. Arden Villa is known as the ''Dynasty Mansion'' as it is home to the infamous Lilly Pond where Krystle & Alexis played out one of their classic catfights. Enduring design, charming upgrades & permanent pedigree make this Palladian Masterpiece the perfect backdrop for a Royal Lifestyle with Olympian Calm." "This magnificent gated two story French Contemporary home is located in the desirable Huntington Library estate neighborhood and adjacent to San Marino. (Re-built in 1998.) The current owners have meticulously remodeled in 2014 with an extraordinary attention to detail. The interior was designed by Malinda Pakzad, famous designer for celebrity. This estate offers 5 suits, custom hand crafted double entry doors, a marble foyer w/ barrel vaulted ceiling & chandeliers, a grand staircase, a gracious living room w/fireplace, a library w/fireplace, an entertainment/media room w/built-in cabinets, a family room w/built-in cabinets and a formal dining room. Numbers French doors lead out to sparkling pool w/waterfall wall, spa & covered poolside BBQ patio. The true Chef's kitchen offers marble countertops, custom wood cabinetry, and includes a Wolfe 6-burner Range, Sub-Zero French door refrigerator/freezer, Double Thermador dishwasher, Thermador built-in coffee system, wine refrigerator and a separate Chinese wok kitchen. Features also include large basement spaces. A huge upstairs patio overlooks a lighted tennis court. The gardens are composed of mature landscaping. A 3 car detached garage with an excise room completes this special property." "Located in the coveted Chapman Woods neighborhood of Pasadena, this East Coast-style Farmhouse marries authentic finishes with coastal contemporary flair for a refined spin on California living. Set upon 1.58 expansive and flat acres, the home features an open-concept floor plan replete with rustic wood details spanning from the white paneled walls to dark wood kitchen beams and dual living spaces bedecked in oak milled from fallen trees on the estate. From the foyer, one is led into the great room with a custom-tile fireplace and onward into the dining room, state-of-the-art kitchen and quaint breakfast nook. The home features seven bedrooms, including the tranquil master suite, and nearly two of everything, from laundry rooms to dishwashers, ovens and more--a true entertainer's dream. Beyond the interior lies an outdoor haven for both kids and adults alike, complete with a pool, junior-size baseball field, batting cage, lighted tennis court, herb garden and seemingly boundless lawn. The estate also comes with a guest home that boasts its own entrance and garage. Here, one has the opportunity to realize a legacy compound for generations to enjoy, all amidst a verdantly secluded and supremely convenient Los Angeles locale." "Located in the verdant seclusion of beautiful trees, this timeless English-styled estate sits within the coveted neighborhood surrounding the Langham Huntington Hotel in Pasadena. This home s sophistication in design exemplifies the finest in architecture. Upon entry, a chandelier illuminates the entrance hall while a staircase elegantly spirals from the second floor. A vaulted ceiling framed with light filtering through bay windows gestures towards a breathtaking living room adorned with a decorated fireplace. The formal dining room exudes tasteful wooden opulence while the gorgeous carpeting and built-in wooden shelves set off the library's vintage charm. The luxurious master bedroom upstairs is complete with a fireplace and several walk-in closets. Stepping down to a family room with an arched ceiling, wet bar, and fireplace, the doors open out to a beautiful covered patio and an immaculately landscaped backyard featuring a large pool and a beautiful pool house. Next to a 4-car garage, the pool house features its own sub-zero fridge and bathroom. The home has been lovingly maintained and upgraded with modern kitchen appliances and new countertops. Purchasing this house is a once-in-a-lifetime opportunity. Professional photos are coming soon." 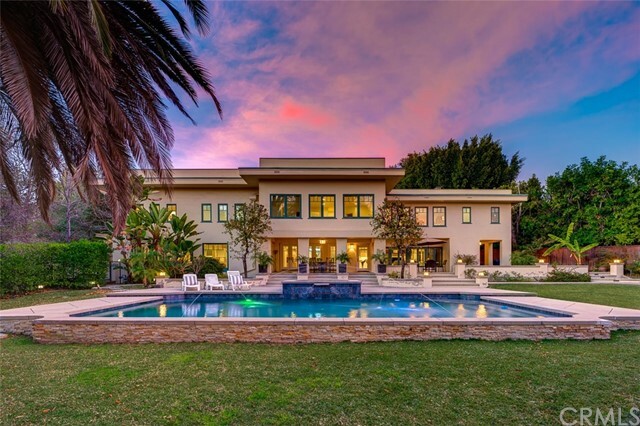 "Hidden in Pasadena s prestigious Huntington Langham Hotel area, this contemporary style mansion is both a beautifully secluded escape and a perfect venue for large scale entertaining. Step inside the main house to a dramatic open concept living room that extends into an outdoor courtyard, sleek restaurant style kitchen, master suite with spa style bath, two additional bedroom suits, den area, wet bar, and executive office suite with separate entry. Upstairs, enjoy a billiards lounge that overlooks the pool, second master suite and three additional bedrooms. A 2-lane bowling alley, home theater, private fitness center, room massage studio, and multimedia room are just a few of the amenities in this home! Outside, you will find an expansive backyard with a salt water pool, spa and cabana. This extraordinary mansion is perfect for entertaining and chic California living!" "Located in the prestigious hills of Pasadena with breathtaking views, reveals a 270 degree view of Los Angeles. This is the ultimate expression of luxury nestled against the base of the San Gabriel mountains with all the modern amenities. The 8 bedrooms, 11 baths, 2 half bathrooms, includes an expansive chef's kitchen and features top of the line appliances, including a Wolf six-burner stove, double ovens, a built-in Wolf Coffee System, and a walk-in pantry. The private gated driveway leads to a stunning front entrance with 4 cars garage and offers sophisticated grand double doors which leads to an impressive entrance with domed ceilings and a luxurious chandelier. The property has beautiful stone flooring throughout the first floor and wood flooring on the second floor. The bedrooms include high quality carpets for premium comfort. Spacious master bedroom has dual large walk-in closets, double sided fire place and a stair way to a private loft. Master bathroom comes with a bath spa, luxurious shower room, and dual vanities. . The second floor also has three additional suites, entertainment area, and two separate balconies overlooking the city view. Two separate basements, one with its own spacious wine cellar and wet bar. The other has space for a theater room. The backyard includes a spectacular heated pool, spa, patio, and a lawn large enough to host gatherings or events." "Discover a perfectly preserved antique Pasadena estate of H.A. Fuller. Put on your spats and step over the threshold into this 1917 built mansion on the most sought after western edge of the Pasadena Arroyo; overlooking the Colorado Bridge and the Vista del Arroyo Hotel. 102 years will vanish, and you will experience the elegant life and architectural majesty of this beautiful time capsule designed by renowned architect Reginald Davis Johnson. Truly timeless in design, quality and class. Every main bedroom has a fireplace and bathroom en suite, all the main rooms have fireplaces and high ceilings. The luxury of elegance and convenience. You will be transported; in more ways than a just ride in the vintage elevator. A time and history that is rarely available." "Well maintained French Normandy estate on coveted Arden Rd. Home rebuild in 1992, features 6 bedrooms and 8 bathrooms with 2 suites on the first level. There are 4 bedrooms & 3 baths on 2nd floor and an office/loft as well. Home Highlights by the formal entryway with voluminous high ceiling and the Stunning designed 2-story-high ceiling family room with view to the rear garden. The master suite features vaulted ceilings, a fireplace, 3 walk-ins, a private setting room, a stunning bath room and balcony. The 3rd floor include a craft room, play room and an office. The grounds are spectacular with multiple patios, outdoor build-in BBQ countertop, a pool with a bridge to the pool house. Pool house offers a professional kitchen, dual sided fireplace, inside Jacuzzi room, a bath room and a gym room. Other amenities are French doors, Bay windows, crown moldings, recessed lighting, balcony, front/back stairway, 6-zoned AC, ceiling fans, ceiling speaker, central vacuum, temperature controlled wine cellar, slate roof, etc. There are 3-car attached garage, circular driveway & motor-court. Wonderful finishes with extensive use of marble, granite, limestone and hardwood finishes. A sophisticated home featuring the finest in Architecture & craftsmanship." "Architectural Modern Estate under construction. This spectacular estate will offer stark sensual lines combined a cladding of wood, stone & sand immediately draw your senses. Architectural features are used to seamlessly blend outside & inside, walls of glass & sliding doors. 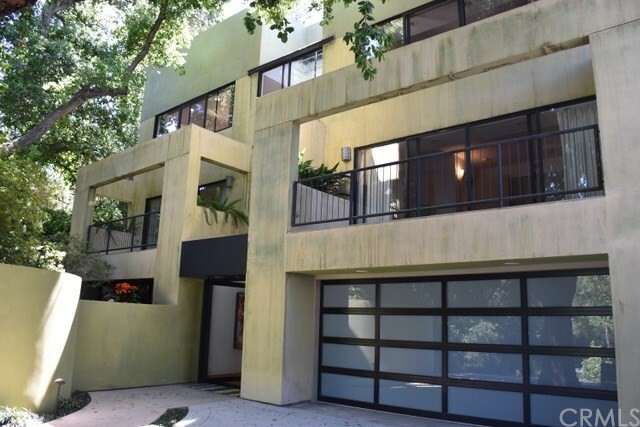 This home captures its soul from the past artist & architects that have made Pasadena's architectural provenance great. Created in collaboration led by Thomas Lake Builder, the inside of the home promises to be as visually exciting as the outside. This home will offer smart home technology, energy efficiency & create a small ecological footprint. Potential to be purchased now and select some of your own finishes. This spectacular estate offers street to street access & situated on nearly 3/4 of an acre,Perched on a knoll overlooking rose bowl & San Gabriel mountains. Dramatic entrance with walls of glass & gorgeous materials leading through courtyard into living area. Generous public rooms, open great room, family room,& gourmet kitchen. Generous master suite as well as 3 bedrooms suites. Game room also offers office & media room/ gym as well as bath with patio areas overlooking pool and yard. Fabulous grounds offer great spaces to entertain." "Hidden on a secluded and private 1.7+ Acre lot, this impressive gated English Tudor Revival Estate is located in the prestigious Langham neighborhood of Pasadena. Designed and built in 1915 by the renowned firm of Hudson & Munsell. The grand wood paneled entry gives you a first glimpse of the exquisite materials and design details used throughout this stately residence. Four fireplaces, hardwood floors, original tile, wood paneling, French doors, original wood windows. Updated kitchen, refurbished bathrooms. Immense grounds with rolling lawns and mature landscaping." "Architecturally significant Colonial home attributed to George Washington Smith in the prestigious Langham Hotel Area of Pasadena. The current owners completely re-built the home including all new systems,400 Amp electrical vault, state of the art audio visual technology, new plumbing, new wiring, creating a traditional roof including attic storage areas! At the same time they added a new master Bedroom and Master Bath as well as an upstairs laundry. They also added a new 3 car garage, New pool, outside barbecue area as well as beautiful new landscaping and patios. This is truly an elegant and refined example of 1922 classic architecture as well as a home with 2019 amenities." "Imagine pulling up you own private driveway walking past the separate guest retreat to the pool party with friends and family. Step inside and relax for a moment in the entertainment area sit and watch the game. Perhaps you want to get a cool drink and gather around the island to talk and laugh and reminisce of the good times shared. People may be eating in the kitchen nook conveniently located near the outdoor BBQ. From the kitchen you have access to the stairs that lead sown to what could be a fantastic game room or wine cellar if you require more space you can entertain in the formal dining room which is between the grand entry and the kitchen. The grand entry is on open area with space for a grand piano perfect for writing and playing the soundtrack of your life. Friends and family stretch out relax and have a glass of wine in front of the warm and soothing fireplace. When you are relaxed and ready to rest you can head up the double wide stairs. Make a entrance to the master suite through the double doors and walk into your walk in closet and pick a plush bathrobe. Maybe you would like to soak in a hot bath or take a refreshing shower. If you are not ready to sleep you can watch tv in the sitting area before retiring to in your soft king size bed. It is easy tosee why some of the greatest movers and shakers in early California history loved this area and why you would want to call this house, Home. The separate guest house is permitted." "' Mi Sueno 'was Designed by Bertram Grosvenor Goodhue in 1916 For Herbert and Georgia Coppell . The original estate had an entrance at 1245 South Grand, then in the 1950's it was divided into 2 separate homes and a Carriage house. 695 Columbia is referred to as the 'South Wing' and has the original Living room. Goodhue is most famously known for his public buildings such as the Los Angeles public Library, Cathedrals and Universities..This impressive estate has been tastefully updated and has had a newer kitchen and family room by famed local architect David Serrurier. Upgrades include newer HVAC, Copper Plumbing. Many systems upgraded." "Gigantic 3/4 acre lot in the heart of Pasadena! Rare opportunity to own an incredible 7 bedroom Tuscan estate in an exceptional neighborhood. This luxury home sits on one of the biggest lots available with a detached guest house and pool. The gated, open air courtyard welcomes you in with a serene fountain and double door entry to the home. This estate boasts a spectacular entry hall and grand living room, and the kitchen is gourmet with beautiful, top of the line cabinetry & appliances. This home has 7 immense bedroom suites and 8 bathrooms (6 full, including two with steam showers). Other amenities include 4 fireplaces mantled with various imported stones, 2 water softeners, 3 wet bars, pre-wired stereo system, and 140 sq ft laundry room. Outside you ll find a detached 3 car garage in addition to the 2 garages attached to the main house. Backyard also features an 800 sq ft guesthouse with full bathroom, as well as a sparkling pool and spa. The attention to detail and the quality of construction is evident in every inch of this gorgeous home, be sure to check it out before it s gone." "The gracious 1906 Bolton House designed by Greene & Greene has been carefully restored & updated preserving the original character & detail of this significant Craftsman Bungalow. A magnificent front door w/ teak inset paneling & Emil Lange stained glass sets the tone for the elegant living room w/ Grueby tile fireplace & the mahogany paneled formal dining room which are separated by a charming sunroom. A handsome butler's pantry w/ nickel sinks & redwood cabinets also houses the elevator. A well-appointed kitchen w/ breakfast area & retreat, a laundry & a maid's room & bath complete the main level. The addition in 1929 of a two story bay window allowing for a guest bath & a graceful stairway landing w/ Judson Studios stained glass was created by Garrett Van Pelt. Upstairs are 5 bedroom suites, one currently used as an office, w/ restored baths, generous closets & period detailing. A finished attic & a permitted basement w/ caterer's gourmet kitchen are additional features. The detached two car garage has a one bedroom, one bath guest house connected behind. With all newer systems, a circular drive & National Register of Historic Places designation, this residence located adjacent South Orange Grove's Millionaire's Row, is a true architectural landmark." "Beautiful estate designed by Marston, Van Pelt and Maybury in 1927 for the prominent John Bacon family. The current owners have created a very livable, elegant and inviting residence, with modern amenities yet preserving the historic grandeur. The gated property is set back off the street, and boasts beautiful landscape, mature trees. The patios invite casual or elegant social events for two to two-hundred. Most rooms have a view to the privacy of the gardens, pool and spa. The kitchen is a chef's dream with breakfast area and opening to the family room and yard. A butler's pantry with extra storage is convenient to the dining room with room for seating of twenty. There are two office/libraries on the main level, exercise/play room and second family/tv room upstairs, four bedroom plus a master suite meant for a king or queen. Separate maid, or in-law suite on the first floor. There is a large basement with generous options for storage or wine cellar, and an over-sized 2-car garage . A very special home for the most discriminating buyer looking for the perfect home near Old Town Pasadena in the coveted Arroyo neighborhood." "This exquisite Pasadena estate sits majestically on the Westside of the Arroyo Seco overlooking Brookside Golf & Country Club offering breathtaking views of the San Gabriel Mountains. This home was originally constructed in 1927 by the architectural team of Bennett & Haskell, architects of the Pasadena Civic Auditorium & the Masonic Temple. In 2014, the estate went through a total ground up restoration & redesign by Stamps & Stamps Architects. Through the gated courtyard one enters a residence that exudes both a traditional elegance & a casual setting perfect for indoor-outdoor entertaining. The lower level boasts a large living room w/ marble fireplace, adjacent wine bar & French doors to the outdoor lounge areas and pool. A guest room, formal dining room & a redesigned gourmet kitchen w/ an additional fireplace & sitting area complete the first floor. The second level includes a large luxurious master retreat w/ marble fireplace, spa like bath suite, closet/dressing room & French doors to the balcony. A private office & additional guest suite complete this elegant residence. 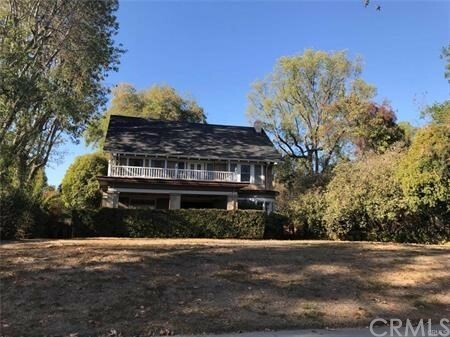 This is a very unique opportunity to be the next steward in this re-imagined spectacular view home in one of Pasadena's most coveted neighborhoods." "***Price significantly reduced by $250,000*** This amazing, single level, Colonial Revival Estate, is located on a private cul-de-sac, in one of East Pasadena's most desirable neighborhoods, Chapman Woods. Upon entering the residence, you will be immediately drawn to the light and bright great room, meticulous attention to detail and quality, sought after upgrades, and quality of craftsmanship including many custom built-ins, wet bar, stained glass and hand painted cabinetry. The 4 or 5 bedroom and 6-bath, floor plan with 4 En-Suites, presents a wonderful flow throughout. An expansive Master Suite offers an abundance of closet space, and spacious master bathroom with with relaxing soaking tub. The gourmet kitchen includes a large island, amazing counter tops, tile selection, and Thermador Professional Appliances. Adjacent is a lovely great room with fireplace making this a perfect spot for family and friends to gather.Located on 2/3rds of an acre, this property offers a four car garage, large motor court, beautiful sparkling pool, jacuzzi and covered cabana, complete with a bathroom and a abundance of storage. You will not want to miss rare opportunity, this home is truly an entertainers dream!" "A beautiful Monterey Colonial designed by architect William McCay and landscape architect Fred Barlow Jr. This residence is situated on over 1/2 acre of private 'park-like' grounds with views of San Gabriel Mountains and Colorado Street Bridge. It's conveniently located within close proximity to Old Town and the Rose Bowl. This 6 bedroom, 5 bath + powder room home is perfectly suited for family living. From the more formal spaces such as: living room with fireplace and built in cabinets and elegant formal dining room with wood carved doors and crown molding; to the more informal gathering spaces such as: large entertainment room with vaulted beamed ceilings, custom built-in bar and glass paneled French doors opening to rear yard and light-filled country kitchen which provides the cornerstone for the breakfast room and the casual seating area with brick fireplace. What truly distinguishes this property is the landscaped front and rear grounds and how the house it sited, to provide the best use of the land. Sited and designed by landscape architect Fred Barlow Jr, the outdoor spaces perfectly complement the main structure. The brick bordered walkway defines the spaces of the large grassy area, specimen trees and plants and leads to pool with cabana." "This custom built 2008 modern home offers close to 3,600 sq ft with panoramic views on a lot of close to 20,000 sq ft. The main floor has a living room, dining room and kitchen with access to the outdoor dining and bbq areas and close to 1,200 sq ft of deck areas. The living room with fireplace boasts a Hemlock tongue and groove beamed ceiling. Lyptus floors adorn the upper level, 9' Sapele hardwood doors run throughout, as well as Anigre baseboards. The gourmet kitchen offers stainless appliances, granite counters, center island, walk in pantry and Anigre built ins. The main level master suite offers vaulted ceiling, Fossil stone fireplace and bath, built ins, vanity area, tub and shower and walk in closet. Main level laundry room facilitates one level living. The lower level offers a family room with Mahogany built ins, fireplace and two additional bedrooms and baths. A wrap around patio leads to the pool and spa area with gardens. There is a pool close bath with pebble stone floor. Additional features include speakers in and out, multiple ceiling fans, plantation shutters, potting area, two tank less water heaters, water softener and filtration systems, two HVAC systems, security system, interior sprinklers, 3 car attached garage and slate decks." "Iconic mid-century modern design circa 1963 by noted architect James Pulliam. Located in the Linda Vista hills near the Rose Bowl, this 2-story 4BR/4BA is a modernist tour-de-force with its desirable glass box design. Set up from the street with incredible mountain views and maximum privacy, enter into a dramatic 2-story foyer with floating staircase. Hallmarks of mid-century design are found throughout including terrazzo floors, walls of glass, custom built-ins and high ceilings. Recent updates include a remodeled kitchen, new floors, updated bathrooms and much more. The open-concept layout brings the outdoors inside at every turn and the indoor/outdoor flow is ideal from nearly every room with easy access to the outside which includes a giant pool, patio, outdoor kitchen and yard. A detached 90sf studio above the property overlooks the hills. 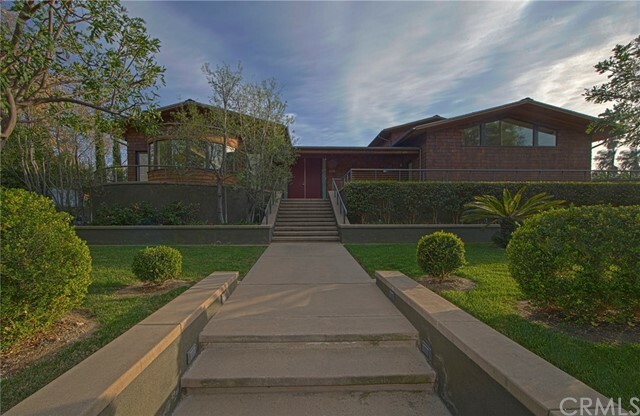 Coveted location at the end of a quiet cul-de-sac, this is Pasadena modern living at its absolute finest." "This elegant Monterey Colonial is situated in an exclusive & highly-coveted estate area in the San Marino school district. Main house has 5 bedrooms & 4 baths. Master suite has large walk-in closet, fireplace and balcony overlooking the park-like yard & sparkling pool & mtn views. Gourmet kitchen boasts a large center island, high end appliances including double oven, cook top, warming drawer, refrigerator, SubZero refrigerator drawers, trash compactor, wine refrigerator, butler's pantry & a breakfast area w/French doors leading to a large patio w/built in BBQ & outdoor fireplace. The kitchen also opens to a light-filled family room w/fireplace, wine storage & French doors to pool & spa. The brightly lit living room has a fireplace & transitions to a sunwashed lanai, where the built in bar & double French doors border the patio as does the formal dining room, creating great flow for entertaining. Home also features laundry rm, interior/exterior sound system, CA/FA, mahogany floors & doors. Guest House offers French doors, 3/4 bth, kitchenette & lrg walk-in closet.There is a large grassy front yard. Backyard features pool/spa, vegetable garden space, grassy rear yard & large stone patio w/built in BBQ & fireplace to enjoy beautiful Cali nights & days"
"Sited on on one of Pasadena s most sought after street with an over 20,000 sq. ft. park-like lot, this Craftsman Style estate has 4,041sq.ft spacious living space. Adjacent to world famed California Institute of Technology, close to PCC, Huntington Library and Botany Garden and South Lake Avenue! lot demontions:100X210." "The Great Oaks - Built in 1983, this gated 3-story Contemporary residence sits on a knoll among mature oak trees. The gracious walkway to the front door winds through a drought tolerant garden, citrus trees and fountain. Upon entering the large glass front door, one is immediately impressed by the incredible amount of wall space to hang one s art collection and the soft, natural light to showcase it. A large guest room and bath on the first floor allow friends, family and/or a live-in a very comfortable and private space to enjoy. There is also an elevator which accesses all three floors. The spacious master suite has a private balcony and patio, a large walk-in closet and spa-like master bathroom. The other 4 bedrooms are equally comfortable, highlighted by huge windows, built-in desks and bookshelves, and spacious closets with built-in dressers. The third floor is an entertainer s delight showcasing a gourmet kitchen with skylights and high-end appliances, breakfast room, family room with built-in bookshelves, a media closet and surround sound. The living and dining great room has a fireplace, built-in speakers, a bar closet with sink, and two wine refrigerators. Sliding glass doors open to a beautiful patio, saltwater pool and spa. Steps up from the yard reveal several raised vegetable garden boxes and an intimate entertaining space and to enjoy the expansive views of the San Gabriel Mountains. This Modern mini-estate in a special offering in a prime neighborhood."